Quapaw Canoe Company provides high quality custom-guided adventures on the Lower Mississippi from Clarksdale, Mississippi. Remote wilderness locations accessed by canoe or kayak. We offer complete packaging: outfitting, guiding, cooking, shuttling & cleanup. All you have to do is arrive with your clothes & personal items and be prepared to paddle. No previous experience necessary. Swimming ability not required (but life jackets are and sometimes wetsuits). Choose your section of river, and weï¿½ll take you there and get you safely back. 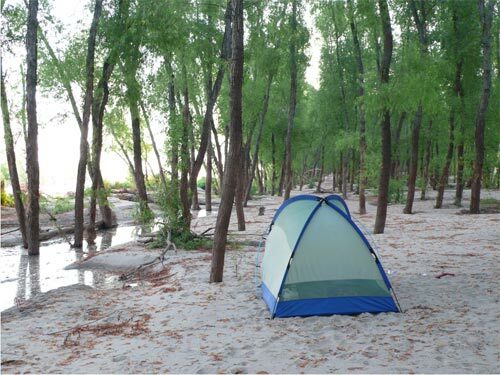 If you don't have a preference we'll take you to our favorite passage: The Muddy Waters Wilderness. Note: If you are on a budget you can buy your own food and prepare & cook your own meals on any trip. If you are an expert paddler and want a self-guided tour, we have a full line-up of rental canoes & kayaks & gear through Quapaw Helena. We will provide you with maps & helpful literature. Our whole purpose is to get you out there and get you back safely! The river is made a better place with the attention of paddlers! Student & group rates available by special request. Click here for rentals at Quapaw Helena. 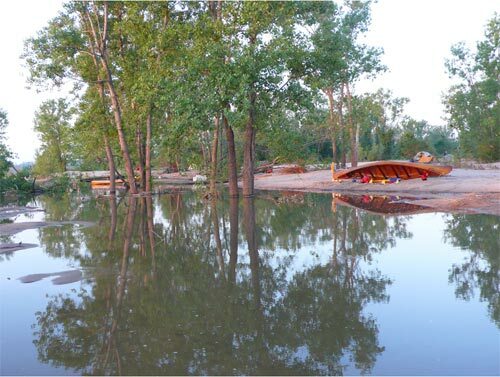 Clarksdale is the home base of operations for Quapaw Canoe Company, and the ideal jump-place for your guided adventure through the watery wilderness of the Lower Mississippi River. Unique accommodations, great eating, down-home Delta blues in the juke joints, and the Delta Blues Museum make for a complete nature-cultural experience for you & your family! More blues musicians come from Clarksdale & surrounding Delta region than any other single place on earth. The main channel of the Mississippi River used to flow adjacent downtown Clarksdale, and it was once the center of a thriving Native American community of 2 - 3,000 known as Quiz-Quiz. There is evidence that Hernando de Soto and his conquistadors passed through this area during their 1540-42 ravage of the Southeast (and became the first Europeans to view the Mighty Mississippi River, which they called ï¿½The Rio Grandeï¿½). Jolliette & Marquette (1673), LaSalle (1681) and John James Audubon (1820) traveled this section of river. Clarksdale, Mississippi, has become the world wide center for custom-guided access to the Lower Mississippi River. All roads lead to the river. Clarksdale is the center of a giant wheel from which all spokes emanate outwards and intersect the big river. We package all of our guided expeditions from here, and then shuttle ï¿½upstreamï¿½ for ï¿½downstreamï¿½ adventures. We go with the flow. Many of our shuttles pass through Stovall Plantation where Muddy Waters lived for 25 years before migrating to Chicago. Other shuttles pass through the ï¿½Humberï¿½ site which was once the largest concentration of Native Americans outside of Cahokia (Charles Peabody, Harvard University, 1897). At journeyï¿½s end our shuttle drivers Wesley Jefferson ï¿½The Mississippi Junebugï¿½ and Ellis Coleman (Super Chikanï¿½s younger brother) pick us up and bring us back to home base. Expeditions above Memphis are shuttled from Mud Island downtown Memphis, Dyersburg, Tennessee or New Madrid Missouri. Expeditions below Vicksburg are shuttled from Vicksburg, Port Gibson or Natchez. In its 11 years of operation Quapaw Canoe Company has demonstrated the viability of safe canoeing on the Lower Mississippi River with countless expeditions involving churches, schools, boy scouts, girl scouts, families, couples and individuals. Quapaw has successfully & safely guided over 1,000s of people on the river. Quapaw Canoe Company is underwritten by Lloydï¿½s of London through Worldwide Outfitters & Guides Association. All expeditions are outfitted with first-aid kits, rescue ropes, life preservers, cellular communication, and VHF marine radio. Life Jackets are best quality US Coast Guard approved type III Life Jackets. Guides stringently practice safe canoeing and are knowledgeable in all aspects of wilderness survival and canoe rescue. Please remember that river travel is always somewhat dependent on river level and prevailing weather. Founder/Owner John Ruskey has been paddling the river since 1982, and is probably its most knowledgeable guide. 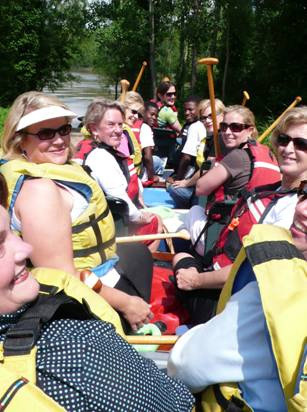 Quapaw Canoe Company provides custom-guided canoe & kayak expeditions, day floats and other paddling adventures along the Lower Mississippi River from Cairo Illinois to St. Francisville, Louisiana. Spectacular reaches include the Kentucky Bluffs, Bessieï¿½s Bend (20 mile bend of the river to go one mile), the 4 Chickasaw Bluffs, Memphis to Vicksburg (300 miles of remote river, only 2 bridges, only one town), Confluence of the Arkansas River & surrounding wilderness areas (rich habitat for the Louisiana Black Bear), Vicksburg to Natchez-Under-the-Hill, Natchez to St. Francisville. Long stretches of river, almost no industry or point-source polluters, few towns, few bridges, big islands, big forests, most varied inland fishery in North America, 60% of Americaï¿½s songbirds, 40% of its migrating waterfowl. Longest free-flowing River (1160 miles). No dams. No schedule: we go whenever our clients are ready. Apprenticeship program for Clarksdale youth, the Mighty Quapaws. Friends of the Sunflower River established 2005. Is it safe to paddle?